Qantas on 04-Feb-213 announced a series of service changes for its Asian network which included retiming some routes, cancelling others while also adding frequencies, ahead of the implementation of its alliance with Emirates, due to commence on 31-Mar-2013. The focus is on a more specifically Asian strategy and it will now turn to finding Asian partners willing to provide regional connections to rival the partnership offered by Singapore Airlines (SIA) and Virgin Australia. With the Emirates alliance, Qantas will move its hub for Kangaroo route services to London from Singapore to Emirates’ Dubai base. Australia's competition authority, the ACCC, has given interim approval for the deal, with a final decision due in Mar-2013. While Qantas is reducing seats overall, the airline claims that because about half of its existing Australia-Singapore traffic transfers to Europe (and will now instead be travelling via Dubai), it will increase the number of Qantas' seats terminating in Asia by about 40%. This will give the carrier an opportunity to compete more effectively against Asian carriers, including SIA, in the fast-growing Australia-Asia market. Qantas is now limited in its ability to compete in this high growth market because unlike its Asian competitors, its Australia-Singapore flights are not timed to facilitate same day Australia-Asia connections and because it has to allocate a significant portion of its Australia-Singapore seats to connections to Europe. In Oct-2012 Qantas announced it would bring forward the departure times of the Sydney and Melbourne services to Singapore, by up to four hours to allow for more favourable onward connections to other Asian destinations on partner airlines. The latest announcement on 04-Feb-2013 adds further network changes to Singapore routes from other Australian ports, but also to Hong Kong and Bangkok, with all departures to those hubs brought forward to between 09:35 and 10:20. In most cases the time shift ranges between two and nearly four hours. The schedule and route changes begin to take effect from 31-Mar-2013 and are the first phase in a planned four-phase programme to improve Qantas’ Asian offering as part of its “growing Asia” strategy. The main Asian network changes in the first phase of the plan will see better access to Hong Kong and Singapore with dedicated capacity increases of between 10% and 40% respectively on the Qantas network, according to the airline. QF29 Melbourne-Hong Kong retimed to better connect to onward flights within Asia. QF127 Sydney-Hong Kong retimed. Services reduce from 11 per week to 7 per week (removal of QF87/88 Sydney-Hong Kong). QF97/98 Brisbane-Hong Kong increased from four flights per week to five in May and to daily in June. All services retimed from 31-Mar-2013 to better connect to onward flights within Asia. QF67/68 Perth-Hong Kong ceases to operate. Perth-Singapore services move from double daily to daily as of 15-Apr-2013. QF77 retimed to better connect to onward flights in Asia, and the return of QF78 arriving back in Perth on the same day at 2320. QF51 Brisbane-Singapore retimed on 15-Apr-2013 to better connect with onward flights. QF23 Sydney-Bangkok retimed to better connect to onward flights within Asia. Four new services per week, timed to better connect to onward flights within Asia, increasing to daily from June. Will result in restoration of double daily services on Sydney-Singapore. QF35 retimed on 15-Apr-2013 to connect better to onward flights within Asia. QF81/82 Adelaide-Singapore ceases to operate as of 14-Apr-2013. Qantas will pull out of the competitive, albeit small, Adelaide-Asia market with its Singapore service ceasing on 14-Apr-2013. Qantas currently operates on the route twice weekly, increasing to three times weekly from 05-Mar-2013, according to Innovata. 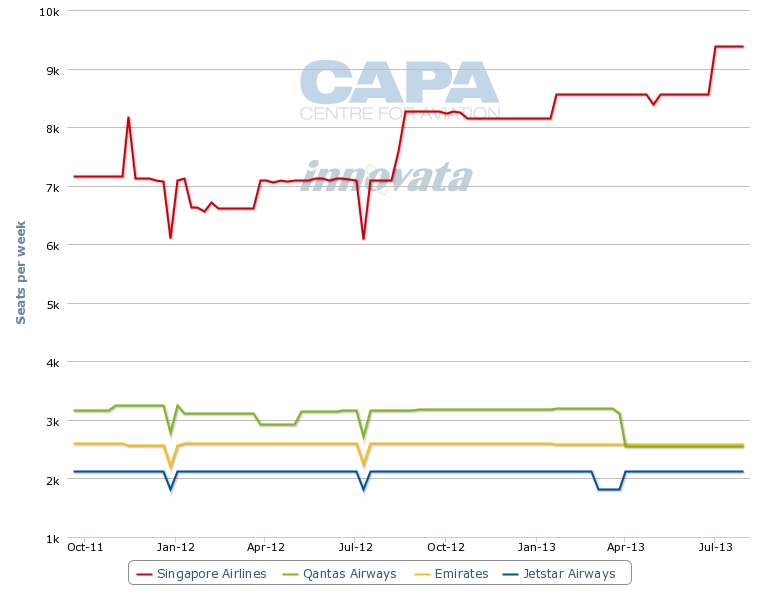 Qantas' problem – unlike Cathay, Emirates and SIA – is that it no longer has onward feed from Singapore to Europe, whereas its competitors do in their respective hubs of Hong Kong, Dubai and Singapore. But Adelaide will continue to be well served for direct Asian connections as Qantas departs. SIA is increasing capacity between Singapore and Adelaide from 10 to 12 weekly frequencies in Jul-2013, giving it over 3,400 weekly one-way seats on the route. Cathay Pacific currently operates a daily A330-300 service between Hong Kong and Adelaide, offering about 900 weekly seats. Malaysia Airlines increased its capacity between Adelaide and Kuala Lumpur in Nov-2012 and currently offers about 2,000 seats a week in each direction, operating double daily with A330-300 aircraft. Among the other changes announced on 04-Feb-2013, services from Perth to Singapore will be reduced to daily and Perth to Hong Kong service will be dropped. Frequencies will increase on the Brisbane-Hong Kong route from four weekly services to daily, currently operated by A330-300 aircraft with 297-seats. That will add 900 seats a week to the route, taking the total capacity to over 2,000. Qantas capacity on the Perth-Singapore route will be halved effective 15-Apr-2013 with the double daily service reducing to daily. The departure time of the remaining morning flight operated using an A330-300 aircraft will be brought forward by about two hours to 09:50 giving a Singapore arrival time of 15:20. This again, allows for better onward Asian connections, but also enables the return flight to arrive back in Perth on the same day. SIA ramped up capacity on the Perth-Singapore route in Nov-2012, adding over 2,000 seats a week. It now operates four daily flights on the route and provides over 8,000 weekly seats, just over double the capacity offered by Qantas. Once Qantas drops one of its two daily flights, SIA will have over four times the capacity as Qantas on Perth-Singapore. Jetstar Asia and Tiger Airways also compete on the route with daily A320 services offering 1,260 seats a week each. The three-times weekly Perth-Hong Kong service will be dropped, leaving the route to Cathay which already dominates the sector with 10-times weekly A330-300 services. Cathay currently offers over 2,800 seats a week on the route against Qantas’ 891 seats. Perth also has direct access to Asia via Bangkok, Kuala Lumpur, Jakarta, Phuket and Guangzhou. Sydney-Hong Kong services will reduce to daily from 11 a week and be retimed to a slightly earlier departure of 09:55. Melbourne-Hong Kong has been retimed to a morning departure, nearly four hours earlier. Brisbane-Hong Kong will have a fifth weekly frequency added in May-2013 before moving to daily in Jun-2013. As with the Sydney-Hong Kong service, these will be retimed to a slightly earlier departure of 10:20 to better connect with onward flights in Asia. Brisbane-Singapore has been retimed from 13:40 to 10:20 daily. The current 19:20 arrival in Singapore was too late for connections within Southeast Asia. Sydney-Bangkok has also been brought forward to 09:40 from 12:15. These changes build on those announced in Oct-2012 for the key Sydney-Singapore and Melbourne-Singapore services. Sydney-Singapore frequencies will initially reduce from double daily to 11 times weekly from 01-Apr-2013 due to the daily Sydney-London A380 service being rerouted via Dubai. Qantas will retain its daily 747-400 Sydney-Singapore flight, which now continues on to Frankfurt, with a slightly adjusted evening schedule. An A330-300 service will be added, initially operating four times weekly at a departure time of 10:40 and arriving in Singapore at 16:00. This service will become daily in Jun-2013 returning the route to double daily status. The net effect is a capacity decrease of 1,120 one-way weekly seats. The timing of the new A330 Sydney-Singapore service allows for better connections to other Asian destinations than the evening arrival of the current A380 and 747-400 services. The latter will be retimed to arrive in Singapore at 19:20 rather than 21:45 under the current schedule. 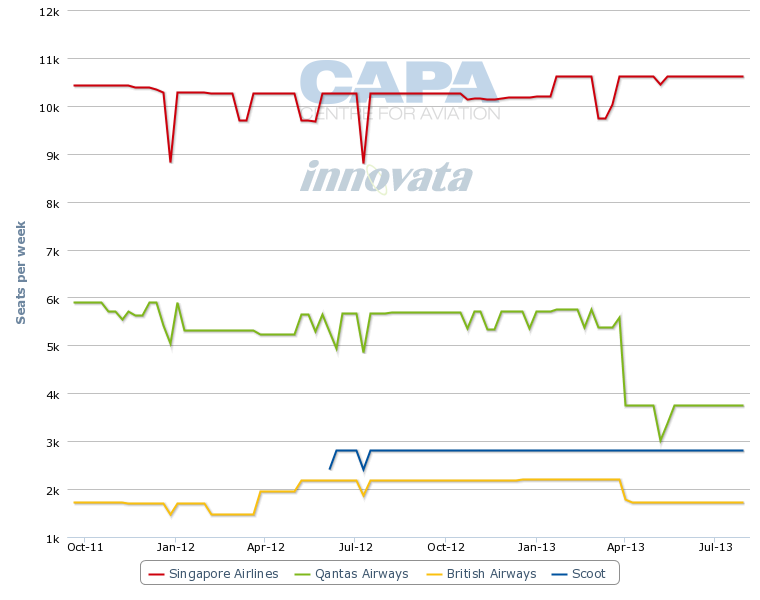 Note: New Qantas A330-300 flight from Sydney to Singapore, announced on 4-Feb-2013, has not yet been captured by Innovata. Melbourne-Singapore, as Qantas announced in Oct-2013, will depart daily at 10:00 instead of 13:40, effective 15-Apr-2013. SIA has significantly increased capacity on this route since Aug-2012, when it offered about 7,000 one-way seats a week. It currently offers about 8,500 seats and this will exceed 9,000 in Jul-2013 after SIA introduces its fourth daily flight on the route. Jetstar also operates daily on the route with a daily A330-200 service offering about 2,000 seats a week departing at the more favourable earlier time of 12:00 and arriving at 16:45. Southeast Asia accounts for more than 300,000 weekly seats from Australia. 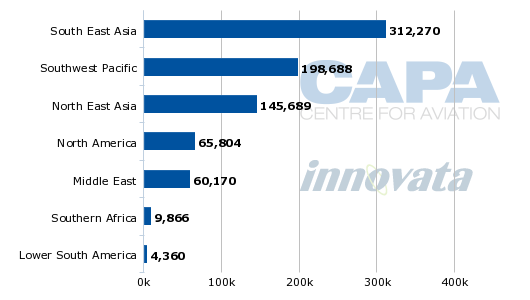 Qantas' capacity share by seats in the Southeast Asia-Australia market is scheduled to fall from over 13% currently to less than 11% in Jul-2013, according to Innovata schedules. In north and south Asia, visitor numbers to Australia from China and India have more than tripled over the past 10 years, according to the Australian Bureau of Statistics. China has leapt from 190,000 visitors in 2002 to 630,000 in 2012, and India from 45,000 to 160,000. China is now Australia’s second biggest inbound market after New Zealand, which recorded 1.2 million visitors in 2012. Seven of the top 10 source countries for short term visitors to Australia are now from Asia, including Japan, Singapore, Malaysia, South Korea and Hong Kong. Emirates continues to operate a selection of one-stop services between Australia and Dubai. As a result, Qantas will also offer further capacity by codesharing on Emirates’ Melbourne-Singapore, Brisbane-Singapore, Sydney-Bangkok and Melbourne-Kuala Lumpur services. Emirates currently has daily flights with 777-300ERs on Melbourne-Singapore and Brisbane-Singapore, both of which continue to Dubai. This will essentially give Emirates and Qantas two daily frequencies on both routes, although a portion of the capacity on the Emirates flights does not get off in Singapore. The Emirates Brisbane-Singapore flight arrives in Singapore early in the morning, which is ideal for connections throughout Asia but the Emirates Melbourne-Singapore flight arrives in Singapore late at night. Qantas will also drop its loss-making Frankfurt service on 15-Apr-2013, six months earlier than previously planned. As Qantas' new Asian strategy rolls out, there are many more parts of the jigsaw to be filled in. More extensive partnerships will be necessary behind the main gateways. Qantas intends to use Jetstar affiliates as part of this process, although these operate in all-economy configuration, so will generally not be able to cater for premium passengers connecting to other points in Asia. Thus, even with the schedule changes to create more favourable onward Asian connections, Qantas will need partners in Singapore other than its LCC Jetstar Asia. This is one of the reasons Qantas had earlier promoted the establishment of a "red tail", i.e. Qantas branded joint venture operation in Southeast Asia. That is now on the backburner and Qantas International CEO Simon Hickey has said the airline will use a combination of Qantas, Jetstar and its other partners to provide its Asia network. It will be a hard sell to convince high-yielding business travellers to switch from full service Qantas in Singapore to LCC Jetstar for the onward flight to another Asian destination. Qantas’ options for other partners are also limited, and its oneworld alliance partners in the region will be of little help. Cathay Pacific and Japan Airlines provide limited destinations from Singapore, and in any case, may be reluctant to work with Qantas given the competitive overlap. Qantas already codeshares with Jetstar Asia on 11 flights, but only four of those provide same day connections under the revised Qantas schedule, including to Bangkok, Ho Chi Minh City, Kuala Lumpur and Phuket, according to Innovata. The remainder are largely early next morning connections. Australia has some bilateral rights to operate fifth freedom services between Singapore, Bangkok and Hong Kong and Qantas did briefly exercise the access provisions in the 1990s, but they fall well short of effective connectivity needs for the future. As ASEAN liberalisation spreads, new opportunities may open up, but even with the most favourable winds that is some time off and Qantas cannot rely on gaining rights in that way. Thus finding new partners becomes a priority for Qantas. In China the focus will be on expanding on the relationship with China Eastern, with whom Qantas currently codeshares to Shanghai and is establishing the locally based Jetstar Hong Kong JV. Qantas will come under increasing pressure from the Virgin Australia-SIA alliance as SIA increases its capacity between the two countries. Virgin and SIA formed a formidable partnership in 2011 with SIA as a cornerstone codeshare partner in Virgin’s virtual international network, mainly – but not exclusively – servicing Asian points. The codeshare covers international and domestic flights in Australia, giving Virgin Australia access to SIA’s extensive Asian network, and was part of Virgin Australia’s strategy in moving to win 20% of the Australian corporate market; that is, it has premium traffic as a keen edge to it. Virgin primarily accesses Europe through its alliance with Etihad – from the Australian cities served by Etihad, with SIA connecting other cities. North America is covered in a partnership with Delta Air Lines. Virgin Australia's array of key partners also includes Air New Zealand. Virgin Australia has drawn SIA even closer since the carrier took a 10% stake in Virgin Australia as part of a three way deal to fund the proposed acquisition of 60% of Tiger Australia and the successful takeover of SkyWest. With the first round of new Asia schedules in place Qantas will turn to improving the customer experience, which includes the opening of a new Qantas lounge in Singapore on 31-Mar-2013 and a new Hong Kong First Class lounge due to open in Sep-2013. A refresh of its international A330 fleet is also being considered, which could include lie-flat beds in business class. Further out, Qantas is investigating adding more Asia destinations using Boeing 787-9 from 2016. Destinations being considered include Beijing, Seoul, Mumbai, Delhi and Tokyo Haneda. The Emirates partnership was a giant step and will make a massive difference to the way Qantas serves all points west and the old world – which looks like being becalmed economically for some time to come. But importantly it does allow the airline's management to focus much more intently on the future markets of Asia, where surely the flag carrier's – and Australia's – opportunities lie. Not coincidentally this is also a key focus for Virgin Australia. Each is keen to establish key partnerships; for Qantas the immediate need is in Southeast Asia, assuming China Eastern is to be a friend in Northeast Asia. Virgin is already well equipped in its relationship with Singapore Airlines; its pressing need is for a north Asian partner. This is the first article in a two-part series on the Australia-Asia market. The second article will look at SIA’s increased focus and strong position in this market, in partnership with Virgin Australia.